Two complementary publications set out to define a systemic approach to the major challenges of the present. The key words are : beyond climate, global resources, human-made chemicals, food and systemic health. The first publication , co-signed with researchers from EPFL and the University of Oslo, lays the legal and political foundations for linking responsible resource stewardship and « planetary health » (the indivisible health of people, societies and nature). That of people is largely a matter of probabilities and concerns each individual. Societal health is above all a question of convention and organization from which everyone should benefit. The health of nature oversees the whole. The three components are the subject of documents recorded or negotiated at the UN level, but their political and economic consideration is not good enough for societal expectations. Humans are strongly health-minded, and are individually and collectively resource-driven, but frame resources incorrectly because public and private resources are unsustainably managed. We have identified public health inequity as politically determinant. This is problematic, because health is a universal value and precondition, outcome, and indicator of sustainable societies. Nature’s goods and services are the ultimate foundation of life and health, but the environmental crisis reflects the depreciation of planetary natural capital. Current governance is not equipped to handle challenges with a holistic approach. Major challenges have resource knowledge and management as a common denominator. Resource overuse marks the interconnectedness between social and ecological systems and is an early warning signal of socio-ecological vulnerability, an unhealthy condition / momentum. Resources, including the human resource, are the matrix of economic and political power systems, of history’s ups and downs. They now constitute a hidden global challenge of our time. Inclusive resource-centered science and education programs do not exist. Resource governance across sectors does not exist. To address these issues, this paper describes a resource-centered science-policy framework. The framework promotes human rights and duties in the public interest through resource justice and environmental responsibility. We associate these principles with the concept of planetary health to facilitate their operationalization and social acceptance. We believe that the proposed framework and the supportive science constitute the most parsimonious route in making the public interest and the societal acceptance the engines of change for a socially just reallocation of resources and their inclusive stewardship. Ongoing programs, practices, experimentations or initiatives indicate that the resource approach is timely and feasible. In the second publication , the concept of « planetary boundaries » has been dissected to identify processes that focus on the major issues for the next 5-10 years : agriculture, as a food system (from fork to field), and the overall physico-chemical disruption (or deregulation). The latter concerns the pollution as a whole (water, soil, air) which exposes all living beings to chemical cocktails whose composition changes with space and time. The corresponding chemical intensification affects societies on a daily basis and on a large scale : anthropogenic chemicals amount 144,000 distinct products, with a 500-fold increase in volume over the last several decades. Thus each individual lives in intimacy (at the table, at work, at school, on vacation) with these cocktails (namely antibiotics, pesticides and herbicides, endocrine disruptors, not forgetting plastics, heavy metals and micro-particles). The main feature of this set is the insidious nature of the risks it entails. These are slow risks to the health of people and the ecosystems. This dynamic and permanent exposure to physico-chemical disruption, the effects of which will never be measured and understood as such, subjects the living, including human populations, to natural selection in real time (disorders of development, infertility, cancers and mortality, but also adaptations and genetic mutations). The proposed solution : a chemical simplification aimed at massively reducing, redesigning, and systematically recycling molecules and particles. In summary, both publications highlight inseparable primary factors of increased social and ecological dumping. They fuel the bulk of climate change and biodiversity erosion, but do not emerge at the top of the list of political, scientific, and societal agendas, despite the fact that they engage in vital political decisions on planetary health issues. and resource management. Diagram. 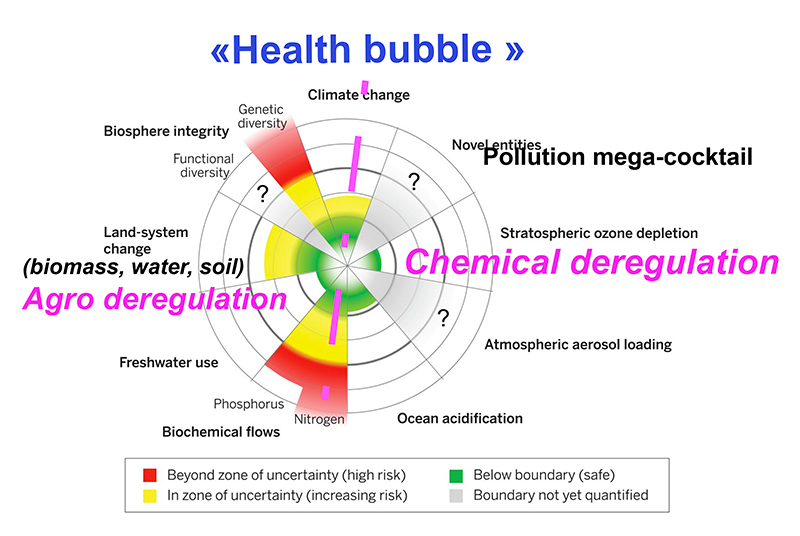 Grouping of planetary boundaries into two main processes : agriculture and global physico-chemical disruption / deregulation. Together, they constitute the Health Bubble of our time. Modified original figure according to Steffen et al (2015), Planetary boundaries : Guiding human development on a changing planet. Science, 347.